Welcome to the March edition of Cook, Learn, Undertake and EAT. Also known as the C.L.U.E. Society, our posts are similar to the board game of CLUE. It involves secrecy, fun, challenge and cooperation with the other game playing members. But don’t be alarmed, there are no murders or mayhem in our society. Each month our members receive the name of a food blog and a theme. We lurk and hunt through our assigned blog to find a recipe that we adore and that fits the month’s theme. Our theme for March centered around potatoes as this is an Irish themed month with St. Paddy’s Day and all. My assignment this month was Lisa from Authentic Suburban Gourmet. Lisa is a Bay Area resident and describes her blog as “an outlet outside of my professional life to express my creativity, passion, imagination and artistic side, through documenting my cooking experiences.” Lisa, me, too. I have to confess that I initially cheated a bit and just did a “potato” search on Lisa’s blog. I immediately found the perfect appetizer and recipe for this post, but then I just had to explore more. Lisa has some delicious recipes and I will add most all of her ninety-five appetizers from her Friday Night Bites posts to my Pinterest “Appetizer” board. We love us some appetizers around here and about once a week, we enjoy a beverage (or two) and appetizers for dinner. The recipe I chose from Lisa’s site just spoke to me. How could I get past bacon and sriracha (and the potatoes for this month’s theme)? 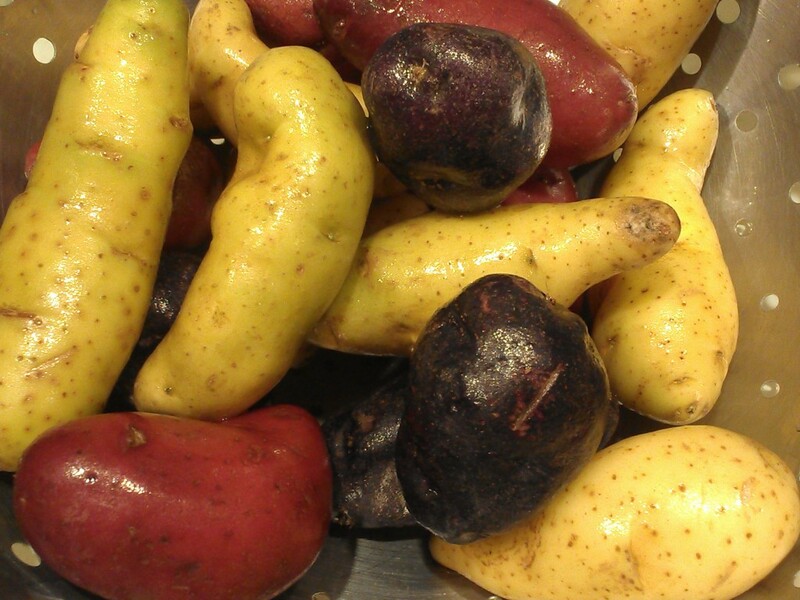 I used red, blue and yellow fingerling potatoes. Place the potatoes in a medium pot, cover with cold water, and bring to a boil. Season the water with 2 teaspoons of salt. Once the water begins to boil, cook the potatoes for 5 minutes, until you can stick a fork into them without too much resistance. You want the potatoes to be almost, but not fully, cooked. Cut the strips of bacon into thirds. Wrap each potato bite in a piece of bacon, securing it with a toothpick. Put the potatoes on a baking sheet spaced an inch or two apart. You may need to cook the potatoes in two batches. Mix the sour cream and sriracha sauce in a small bowl. Pile the potato bites on a plate and serve alongside the dip. The only addition I made to this fantastic recipe was to drizzle a bit of cilantro sauce over the top of the sriracha dip to emphasize our St. Patrick Day theme for March. (The green sauce isn’t really evident—it promptly sank.) I also was snow bound when I made this appetizer and I didn’t have any sour cream on hand. I used 1/4 c. plain Greek yogurt and 1/4 c. mayo for the sauce with plenty of sriracha. 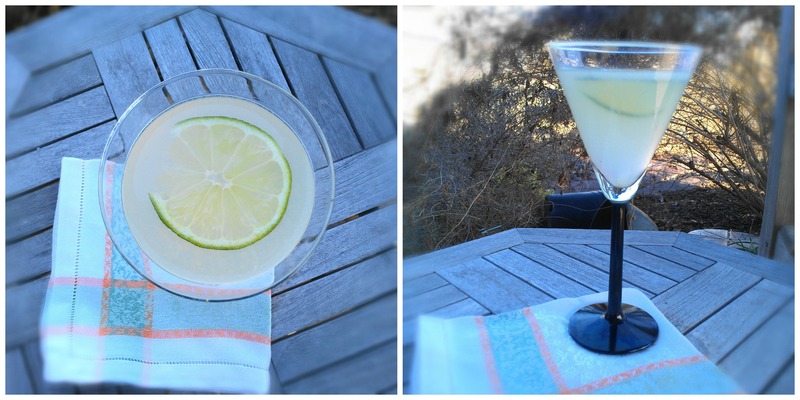 And since Kate, one of the founders of C.L.U.E., reminded us all that vodka is made from potatoes, I couldn’t resist whipping up Lisa’s Ginger Zen Martini to accompany this appetizer. Spicy bites need a cocktail with a bite, wouldn’t you agree? 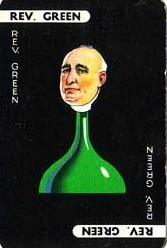 So, since it is close to St. Patrick’s Day and the wearin’ of the green, I think that Reverend Green from the board game CLUE looks like he could use a martini (and some spicy bites), as well. It was almost warm enough to partake of these outside. 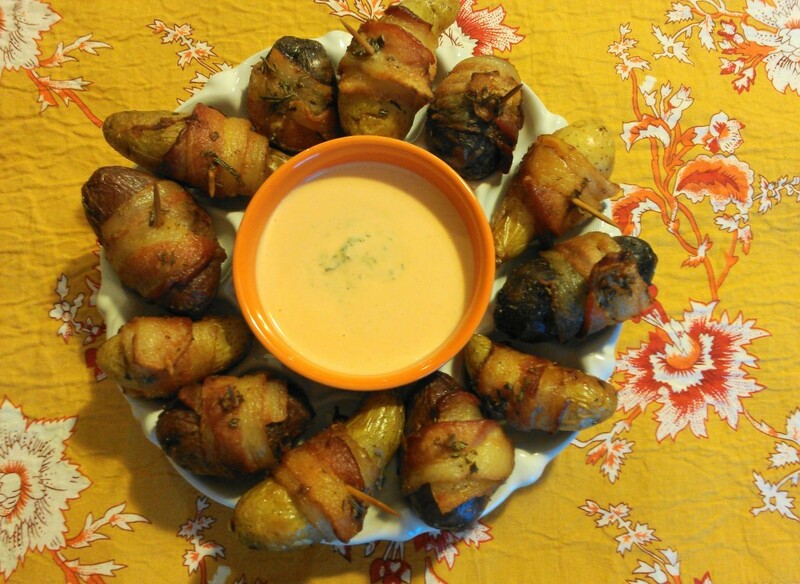 Almost…..
54 comments to Bacon Wrapped Potatoes with Sriracha Sauce for C.L.U.E. Oh, my gosh, do these spuds look spectacular! Bacon and spice? A winner for sure!!! A winning recipe we will certainly keep around. When I saw the title of your post, I knew we would get along, Debra. Then you added a vodka martini and I’m writing the vows. (Just don’t tell my husband, okay?) Those spicy spuds and that martini must have made for a wonderful evening! The secret is safe with me! I want to come hang out at your house!!! These look so delicious! Even Mr. Picky Eater would LOVE to eat these – YUM! I would hope he would eat these! Who doesn’t love bacon-wrapped goodness? They look fingerlickingly delicious! I love the idea of wrapping baby potatoes with bacon. Bacon? Potatoes? Say no more! OK, if you have to say more — Sriracha! Really good — thanks. Spicy….bacon….potato I am sold! Love the punch of flavor that the Sriracha Sauce must give these little guys…yum! Hmmmm…. Highest bidder? Could we auction these off? I’ve been lucky enough to taste some of the delicious treats that Lisa makes in her kitchen so I know these are a winner. These would be a hit with everyone! I am so, so, so jealous. Yes please! I’ll have a cocktail & that delectable appetizer. Bacon & potato- can’t go wrong! Adding bacon is kind of like deep fat frying…..you can’t go wrong! Yummmmmy! Bacon and potatoes are a match made in heaven, and I love your addition of the cilanro sauce. I’d eat these as a meal, for sure. Definitely a marriage of deliciousness! Oh wow, do these potatoes look delectable! And I love the martini…a perfect match! It was just what the party needed. All of my favorite things in one delicious bite–I’m in! These look wonderful Debra, what a great idea! But then again, you’re right, all Lisa’s appetizers are amazing! She’s going to keep us supplied with delicious recipes for our weekly app parties for two! Bacon + potatoes– yes, please!! These sound so good, I’ll have to try them soon. Pretty easy app to whip up. Perfect for upcoming patio parties. Potatoes…bacon…Sriracha????? goodness! This sounds incredible. Fabulous choice and I must try this soon. Pinned. You will love this, Lea Ann. I’m in! Bacon and potatoes. Can’t get much better!!! You picked a winner! And reminded me that I need to make these again soon. Thank you for the kind words! Loving the cocktails you paired with them. Cheers! That is part of the fun of clubs like this…being reminded of old recipes that need revisited. How can one go wrong with bacon? I love thr sauce too, perfect appetizer! And, they’re even good cold as leftovers. Again, you sound a lot like me. 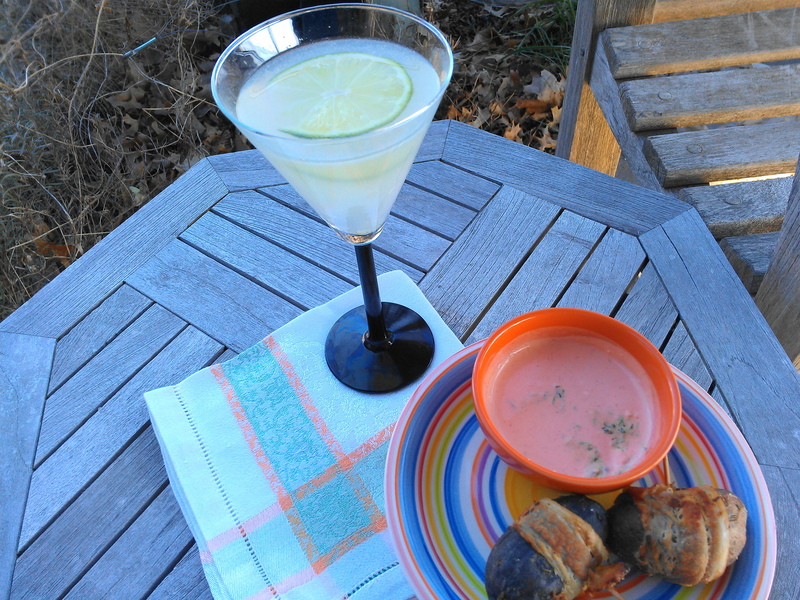 We love having appetizers for supper, though with my blood pressure I can’t do much in the drinking department anymore. I probably would have gravitated towards the potatoes wrapped in bacon too. And that Sriracha sauce? Swoon. Make a ginger-laced limeade and enjoy it in a martini glass instead. Oh!! A martini AND spicy bites?? I think I want to be your neighbor!! Sriracha is a favorite around my house and I can see these beauties disappearing in a flash. Well done! I could slurp up this sauce alone! 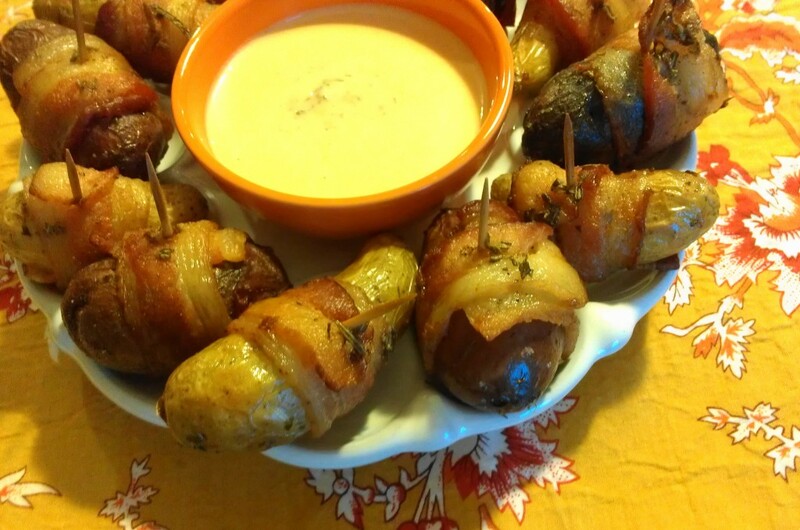 Fingerlings are my favorite potato to make and I love, love, love these bacon wrapped ones! Good choice of recipe and great job executing it! What fun! I loved the blue variety….they were so creamy.